Astronomers Detect Mysterious 'Icy' Object Beyond Neptune's Orbit, But Have NO Idea What It Is! Astronomers Detect Mysterious ‘Icy’ Object Beyond Neptune’s Orbit, But Have NO Idea What It Is! Scientists are both excited and mystified. A team of astronomers using the Panoramic Survey Telescope & Rapid Response System (Pan-STARRS) discovered something really weird beyond Neptune’s orbit. A new object, named Niku deriving its name from the Chinese word for “Rebellious”, was discovered just beyond Neptune’s orbit. The mysterious icy object has been found orbiting the Sun, nearly perpendicular to the planets in the Solar System (hence the name). Niku orbits the Sun on a plane tilted 110 degrees above the orbital plane of the planets in the Solar System. But the weirdest thing about Niku is that it orbits backwards, opposite the orbital direction of the planets. This is abnormal because the rest of the planets and objects in the Solar System orbit the sun counter-clockwise, or prograde. But while Niku could have easily been dismissed as just another collision victim, additional findings have astronomers throwing that logic out the window and scratching their heads even more. They found that Niku is not alone. Apparently, Niku is a part of an ENTIRE GROUP of objects orbiting the Sun in this inclination, and in this direction. “I hope everyone has buckled their seat belts because the outer solar system just got a lot weirder,” says Michele Bannister, an astronomer at Queens University, Belfast tweeted. Scientists don’t have a lot of theories. However, one that keeps returning to their minds is the mysterious and still mythical Planet Nine. It was the primary suspect to the alteration. Further scrutiny concluded that Niku is too close to the center of the Solar System, beyond a hypothetical Planet Nine’s gravitational reach. But considering how little we know of the Cosmos, who knows what’s possible. It’s really hard to leave this phenomena without explanation. As far as science knows objects do not just start orbiting counter other objects in one solar system on their own. And certainly not a group of objects! “It suggests that there’s more going on in the outer solar system than we’re fully aware of,” says Matthew Holman, a senior astrophysicist at the Harvard-Smithsonian Center told The New Scientist. Bannister enjoys the confusion that comes with it: “It’s wonderful that it’s so confusing,” she says. Discoveries like Niku are really exciting. They show us there are so many things out there we don’t understand. There is so much yet to be discovered. Mystery is freeing! What are your theories? 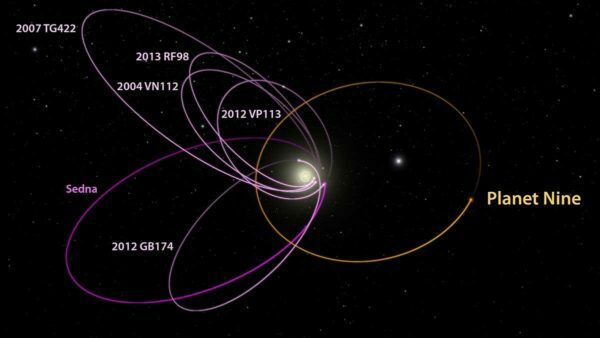 Could the entire ‘rebellious’ group be proof of Planet Nine? Or is there something even stranger in play?